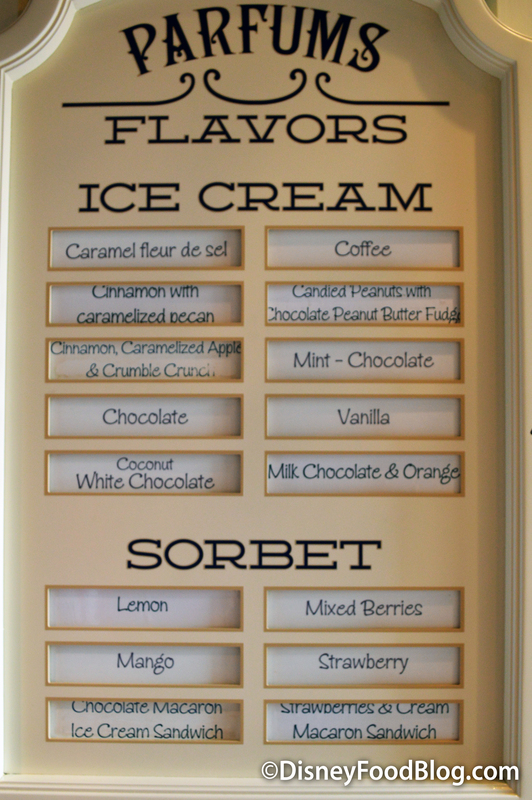 … and look for the new flavor listed on the menu among the 16 currently featured flavors of ice cream and sorbet, all made in-house. I know it’s hard to resist ordering your favorite, but trust me… it can be fun to mix things up here, too! And now it’s time to dig into the Candied Peanuts with Chocolate Peanut Butter Fudge. Just about the only ingredient that didn’t make it into the name is the vanilla ice cream that serves as the base flavor for the ice cream. 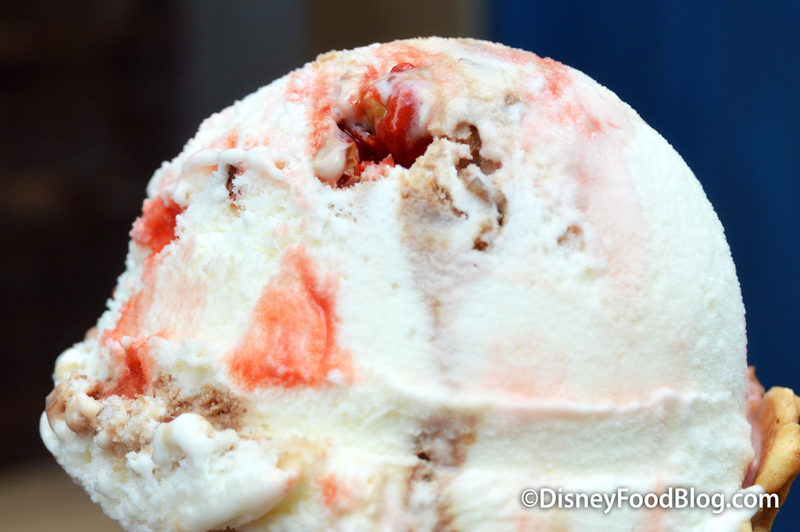 Beyond that is where the fun really kicks in with a TON of red candied peanuts mixed throughout: savory peanuts covered with a crunchy sugar coating. The next components are both chocolate fudge and peanut butter swirled into the ice cream. 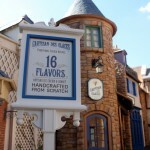 The chocolate fudge is as rich as it sounds, but it’s mixed in sparingly so as to not overwhelm the other flavors. It allows the peanut butter, especially, to stand out. The peanut butter was amazingly fresh; so much so that it still had the same texture as peanut butter right out of the jar as opposed of the stiff, frozen ribbons typically associated with peanut butter mixed in ice cream. 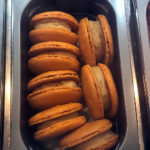 Look, I know I say this fairly often when trying new flavors at L’Artisan, but I’m gonna say it again… this new flavor is one of the best yet. Not only is it a hit for the combo of sweet-and-salty (the candied peanuts deliver a LOT of sweetness, but the peanut butter is so flavorful that it balances really well), but also for the combo of chocolate and peanut butter. AND chocolate and vanilla. 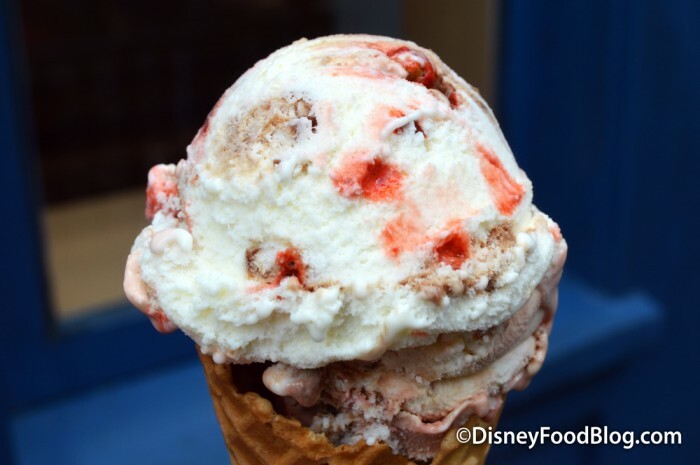 The Cast Members I spoke with weren’t sure if the Candied Peanuts with Chocolate Peanut Butter Fudge Ice Cream is simply seasonal or sticking around for the long haul, so get it while the gettin’s good! 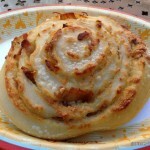 That said, I’m keeping my fingers crossed that this one stays on the menu for a long time to come! 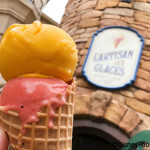 What’s your favorite flavor at L’Artisan des Glaces? Please let us know with a comment! 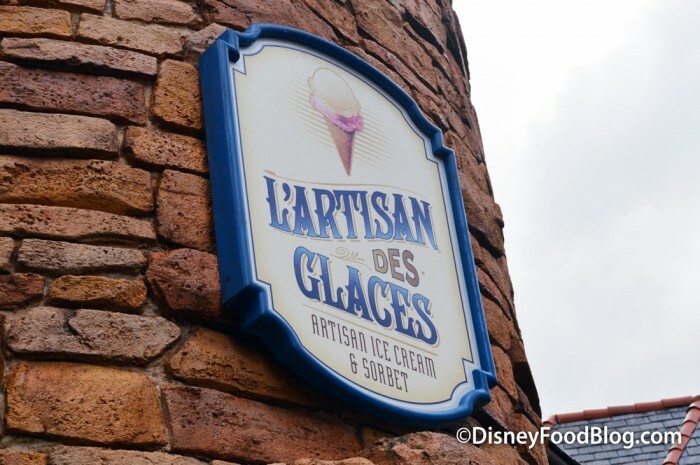 Epcot’s L’Artisan des Glaces Celebrates its Second Anniversary with New Flavors and Sundaes! I arrive in two weeks. I can’t wait to try this! Thanks for the review! It was actually not what I was expecting based on the name- for some reason I was thinking it would be a chocolate-peanut butter ice cream with the candied peanuts mixed in. Still looks delicious! 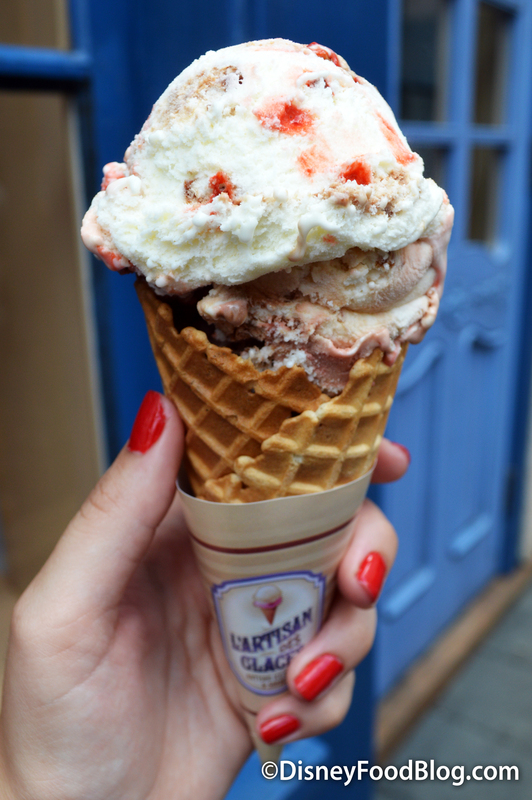 Completely agree – the peanut butter flavor delivered by this ice cream was fantastic to me. Amazing how naturally it came through with each bite. In general, ice creams tend to have the fudge/chocolate dominate, but not in this one. Another terrific offering from this Showcase gem. I don’t have a fave yet, but would I love a scoop of this right now! Oh, AJ, this looks wicked. Got to try it. 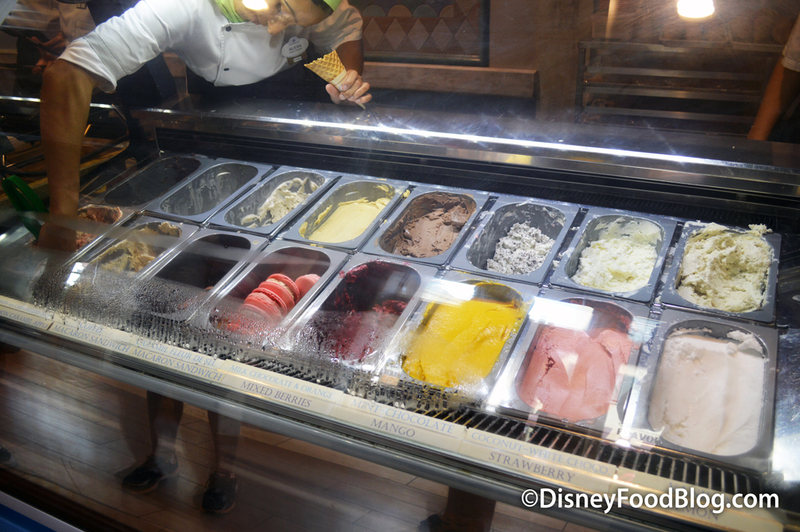 Can’t go wrong with ice cream here.